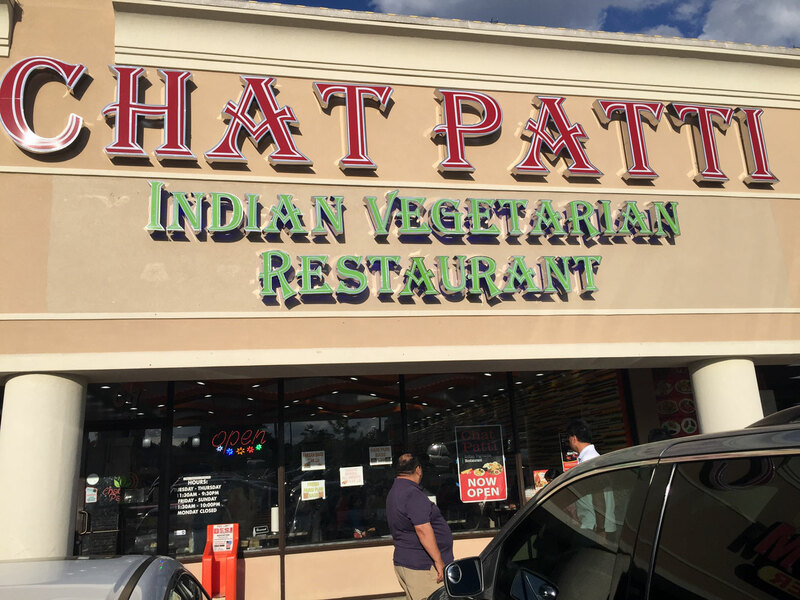 You can find Chat Patti at 1707 Church Street Suite C7, Decatur 30033 in Patel Plaza, the same shopping center anchored by Patel Bros. This is a new location for the restaurant formerly off of N Druid Hills Rd. The sign from the street is quite large - hard to miss. 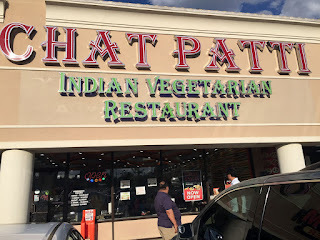 This restaurant specializes more in what you would find in India as vegetarian street food - the prices are very reasonable and the food very good. A chat or more commonly chaat is a snacky food you would buy from a roadside vendor. 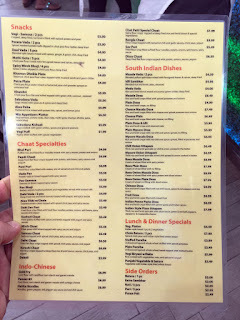 It usually starts with a bit of fried dough, samosa or similar and then is made more flavorful through an assortment of toppings, veggies like onion, chick peas, fresh herbs, curries, chutneys and sauces. The variation is endless and it's hit the US like wildfire as the flavors are multi-level, changing with every bite (sweet, savory, salty, spicy, the list goes on). 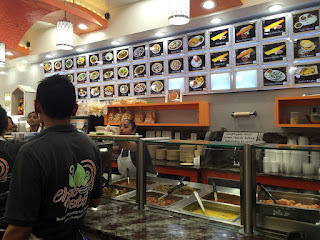 I saw puris and regular vegetarian dishes as well so the restaurant is fairly well rounded. 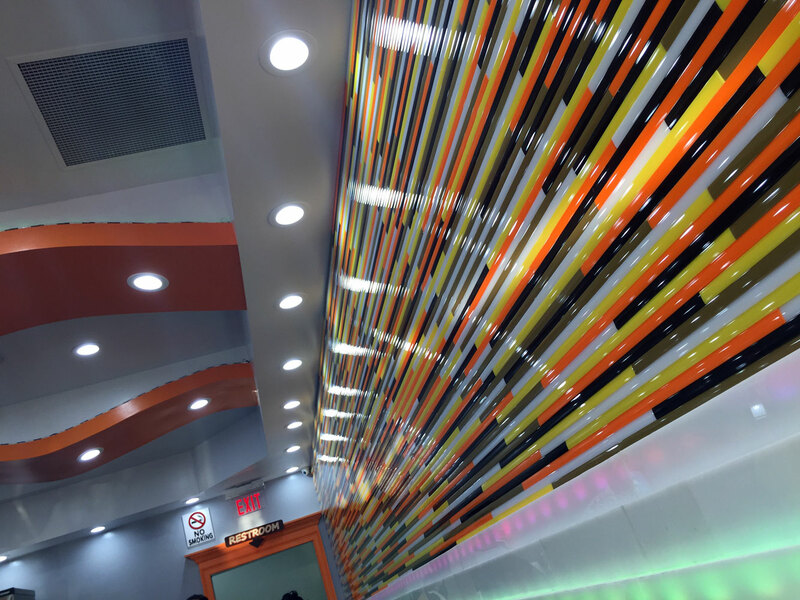 Chat Patti is basically brand-spanking new on the interior with festive, modernist elements that would make any US fast-casual restaurant proud. 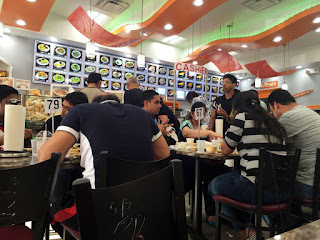 This place stays busy and it can be hard to get a table, especially on the weekends but you should order anyway as most of the people eating finish up fairly quickly. Ordering is done at the counter and they bring your food to you at small tables. 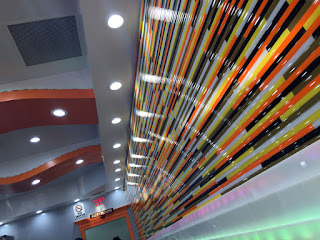 There are convenient photos of dishes on the wall and the employees were really knowledgeable and spoke good English. I found the service quite good with the various employees very attentive. 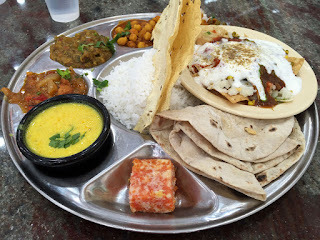 I like to sample a lot of items so I chose the veggie thali plate - if you haven't tried one before you should as these offer small dishes on a large oval or round platter with an assortment of foods - I saw some during my stay in India that were massive with a dozen or more items. I thought this massive platter (15 or so inches in diameter) had some awesome variation including 3 curries, soup, a chaat, rice, papadum, chapatis and a bit of dessert. It was quite good and extremely filling. 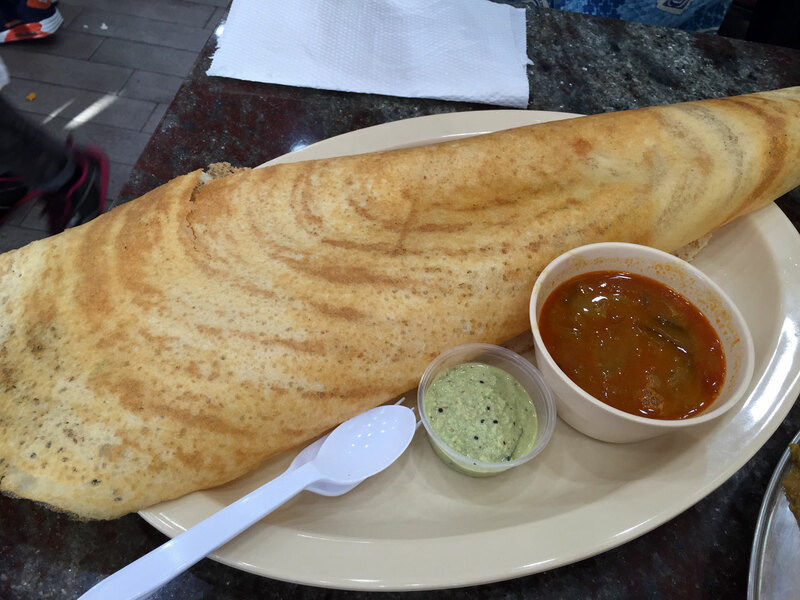 We also ordered one of my favorite dishes, a Masala Dosa. This is a thin crepe-like pancake rolled over a compote of curried potatoes, served with coconut chutney and sambar. They had several variations so I'm not quite sure what we received. When I was visiting India I ate one of these just about every morning for breakfast. In the South they are traditionally served on a banana leaf - you don't get that here (I'd be surprised if you got that anywhere in the US), but the flavors and size of the Dosas at Chat Patti are superb. We made quite a meal out of these two items and left very stuffed indeed. 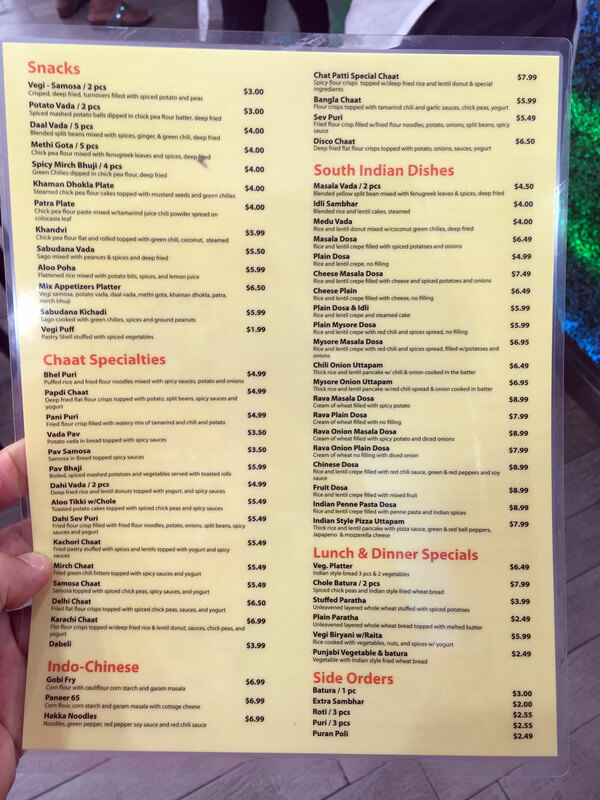 The flavors were spot on and the prices super reasonable (especially when compared to one of my favorites, Chai Pani in downtown Decatur). What are you waiting for? Kripyā bhojan kā ānnaṅd lijīyai!